PEORIA – At age 88, Rev. Eugene Black says his one wish would be that he was just starting out in the ministry. For 49 years, Black faithfully served congregations in the former Southern Illinois Conference until mandatory retirement at age 70 in 1995. Then a year later, he embarked on a 14-year second career as visitation pastor of Mattoon First UMC, retiring again at age 85. 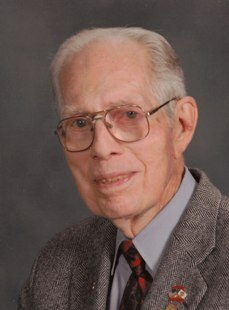 For this record of service, Black was named the 2013 Peter Cartwright Lifetime Achievement Award recipient by the Evangelism Committee of the Illinois Great Rivers Conference. The award was presented at the John Wesley Fellowship of Illinois luncheon June 6 during the church’s annual conference in Peoria. The Peter Cartwright Lifetime Evangelism Award of the Illinois Great Rivers Conference is awarded to someone who has exceptional leadership qualities to help our conference in making disciples of Jesus Christ. This person's lifetime example challenges pastors and lay people to share the Good News of Jesus Christ with others and whose commitment to evangelism is reflected throughout their ministerial career. Rev. R. David Reynolds, who retired from active ministry in 2012, nominated Black for the award. Reynolds was one of 17 persons who were called into the ministry during Black’s active ministry which began in 1946. Reynolds was joined by retired pastor Kenneth Cox and Ron Dickinson, currently serving at O’Fallon First UMC, as co-nominators. Cox and Dickinson both worked with Black at Mattoon First UMC. Following military service in World War II, Black returned and enrolled at McKendree College in the fall of 1946. He was assigned to his first appointment at Freeburg and New Athens as a student pastor. Following graduation in 1950, Black began seminary at Asbury Theological Seminary in Wilmore, Ky. After two years, Asbury lost its accreditation and so, Black finished his seminary education at Candler School of Theology while pastoring a five-point charge outside Eatonton, Ga. It was during this year in Georgia where Black conducted three weeks of revival services which led to the conversion of an 84-year-old man and a middle-aged alcoholic. It was the first of three individuals past the age of 70 that he would lead to Christ during his ministerial career – an accomplishment Billy Graham once estimated at 1 in 1.5 million to occur just once. In the summer of 1957, Black’s second appointment out of seminary was to Marion Aldersgate Methodist Church. Three pastors had turned down the appointment and Black was sent by Bishop Charles Brasheares to the former M.E. South congregation. With a group of 12 persons gathering for prayer each week prior to the service combined with a lay visitation program organized by Black, the congregation began to outgrow its sanctuary on South Market Street. Aldersgate purchased a tract of land for $40,000 where the current church is located. Within 18 months, the State of Illinois announced the rerouting of Illinois Route 13 away from the downtown area and right in front of the church’s property. Black said the church was offered $500,000 for the land and declined to sell. The church was poised for exponential growth as they built a new facility. Black discovered many years ago what George Barna confirmed in 2004 – that among youth and children who accept Christ at an early age, 83 percent do so at a camping or retreat setting. Black became acquainted with Beulah Camp as a child, when his father walked 10 miles to catch a ride to the holiness camp meeting to hear the famed evangelist Dr. John R. Church. After the return trip, his father walked 10 miles home and told his family of his experience. As a result, Black would begin a long-standing association with Beulah Camp, attending as a youth and then continuously since 1953 as an adult. Black has served on the core staff of the youth institute (which began in 1932 and pre-dates the Conference’s camping ministry) as teacher, registrar, curriculum dean, business manager and director. He has served continuously on the holiness camp’s board of trustees since 1963 and will complete 50 years of service this summer. During his active ministry, Black would offer to take youth to camp with the following deal: “If you aren’t having fun within the first two days, I will bring you home.” Black never had to make an extra trip home as many youth fell in love with the camping experience and returned for many years – even after reaching adulthood. A 1950 graduate of McKendree College and a 1953 graduate of Candler School of Theology, Black served the following appointments during his ministry: Freeburg-New Athens (1946-50); Associate Pastor, Lexington (Ky.) Epworth (1950-51); Mt. Edwin, near Versailles, Ky. (1951-52); West Putnam Circuit, Eatonton, Ga. (5 churches – 1952-53); Brookport-Powers-Zion (1953-57); Marion Aldersgate (1957-66); Centralia Faith-Posey (1966-69); St. Elmo First (1969-78); Oblong Central-Seed Chapel (1978-82); Eldorado First-Beulah Heights (1982-89); Herrin First (1989-1995). Black credits his wife Helen for being able to accomplish what he has in ministry. The couple will celebrate their 68th wedding anniversary in September.